When George Washington became president in 1789, he appointed Alexander Hamilton as his secretary of the Treasury. Hamilton’s vision for the economic foundation of the United States included three main programs: 1) the federal assumption of state debts, 2) the creation of a Bank of the United States, and 3) support for the new nation’s emerging industries. 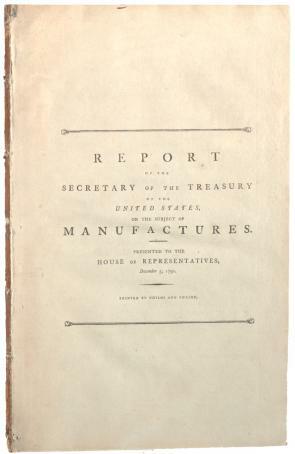 After the first two parts of his plan had been accepted, he presented the third part to Congress in his Report on the Subject of Manufactures in December 1791. Through high tariffs designed to protect American industry from foreign competition, government bounties and subsidies, and internal improvements and transportation, Hamilton hoped to break Britain’s manufacturing hold on the United States. The most eloquent opposition to Hamilton’s proposals came from Thomas Jefferson, Washington’s secretary of state, who believed that the growth of manufacturing threatened the values of an agrarian way of life. Hamilton’s vision of America’s future directly challenged Jefferson’s ideal of a nation of farmers maintaining personal freedom through landownership. Jefferson feared factory workers would be manipulated by their employers, who would make it impossible for them to think and act as independent citizens. Although Jefferson and his followers successfully painted Hamilton as an elitist promoter of a deferential social order and an admirer of monarchical Britain, in fact Hamilton offered a remarkably modern economic vision based on investment, industry, and expanded commerce. Most strikingly, it was an economic vision with no place for slavery. Before the 1790s, the American economy, in both North and South, was tied to a transatlantic system of slavery. A member of New York’s first anti-slavery society, Hamilton wanted to reorient the American economy. A transcript of selected excerpts is available. The expediency of encouraging manufactures in the United States, which was no long since deemed very questionable, appears at this time to be pretty generally admitted. The embarrassments which have obstructed the progress of our external trade, have led to serious reflections on the necessity of enlarging the sphere of our domestic commerce: the restrictive regulations, which in foreign markets abridge the vent of the increasing surplus of our agricultural produce, serve to beget an earnest desire, that a more extensive demand for that surplus may be created at home: And the complete success conspiring with the promising symptoms which attend some less mature essays in others, justify a hope, that the obstacles to the growth of this species of industry are less formidable than they were apprehended to be; and that it is not difficult to find, in its further extension, a full indemnification for any external disadvantages, which are or may be experienced, as well as an accession of resources, favorable to national independence and safety. [p3] It has been maintained that agriculture is, not only, the most productive but the only productive species of industry. The reality of this suggestion, in either respect, has, however, not been verified by any accurate detail of facts and calculations; and the general arguments, which are adduced to prove it, are rather subtil [sic] and paradoxical, than solid or convincing. [p31] It is not uncommon to meet with an opinion that though the promoting of manufactures, may be the interest of a part of the union, it is contrary to that of another part. The northern and southern regions are sometimes represented as having adverse interests in this respect. Those are called manufacturing, these agricultural states, and a species of opposition is imagined to subsist between the manufacturing and agricultural interests. The idea of an opposition between those two interests is the common error of the early periods of every country, but experience gradually dissipates it. Indeed they are perceived so often to succour and to befriend each other, that they come at length to be considered as one; a supposition which has been frequently abused, and is not universally true. Particular encouragements of particular manufactures may be of a nature to sacrifice the interests of landholders to those of manufacturers; but it is nevertheless a maxim well established by experience, and generally acknowledged, where there has been sufficient experience, that the aggregate prosperity of manufactures, and the aggregate prosperity of agriculture are intimately connected. In the course of discussion which has had place, various weighty considerations have been adduced operating in support of that maxim. Perhaps the superior steadiness of the demand of a domestic market for the surplus produce of the soil, is alone a convincing argument of its truth. In proportion as the mind is accustomed to trace the intimate connection of interest, which subsists between all the parts of a society, united under the same government; the infinite variety of channels which serve to circulate the prosperity of each to and through the rest, in that proportion will it be little apt to be disturbed by solicitudes and apprehensions which originate in local discriminations. It is a truth as important, as it is agreeable, and one to which it is not easy to imagine exceptions, that everything tending to establish substantial and permanent order, in the affairs of a country, to increase the total mass of industry and opulence, is ultimately beneficial to every part of it. On the credit of this great truth, an acquiescence may safely be accorded, from every quarter, to all institutions, and arrangements, which promise a confirmation of public order, and an augmentation of national resource. [p58] In countries where there is great private wealth much may be effected by the voluntary contributions of patriotic individuals; but in a community situated like that of the United States, the public purse must supply the deficiency of private resource. In what can it be so useful as in prompting and improving the efforts of industry? Read the document introduction and transcribed excerpt and apply your knowledge of American history in order to answer these questions. Present evidence to support or refute the following statements: a) Alexander Hamilton envisioned the future of the United States realistically; b) Thomas Jefferson had an idealistic view of America. How would Hamilton and Jefferson explain the current economic turmoil in banking, finance, and industry? Hamilton argued that the interests and well-being of the industry-focused North and the agricultural South were linked. What arguments did he present to validate that theory?